Control code for units either shipped to California Emissions States dealers or ordered by California Emissions States dealers for registration in non-California States locations. (In Maine and Vermont, dealers cannot order vehicles for customers in non-California Emissions State locations, except Public Service/Emergency Vehicles- 936). Includes four (4) LT275/65R20E BSW all-terrain tires, one (1) LT275/70R18E BSW all-terrain spare tire and 20" premium polished forged aluminum wheels with bright hub covers and center ornaments. Includes lower accent two-tone paint, unique chrome grille with accent color insert, accent color front bumper, body color exterior door handles, accent color front and rear wheel lip molding, lower body-side molding, and molded cab steps, unique accent color box top and tailgate moldings, accent color rear bumper with step pad, PowerScope power telescoping and folding trailer tow mirrors with power/heated glass, integrated clearance lights, turn signals and memory feature, body color mirror caps, unique 18" painted aluminum wheels with unique center caps with King Ranch logo, power sliding rear window, memory power adjustable pedals, unique front and rear floor mats with King Ranch logo, front heated seats, unique door trim panels with King Ranch Chaparral leather insert and woodgrain applique, front and rear consoles with King Ranch Chaparral leather-covered lid/armrests, unique King Ranch Chaparral leather-wrapped steering wheel with redundant controls, unique King Ranch Chaparral leather seating surfaces quad captain's chairs, memory power adjustable driver seat and power adjustable passenger seat. Includes 6.8L V10 engine with 362 hp @ 4,750 rpm and 457 lb-ft of torque @ 3,250 rpm. Includes transfer case and fuel tank skid plates and unique "4x4 Off Road" box decal. Includes lower accent two-tone paint, unique chrome grille with accent color insert, accent color front bumper, body color exterior door handles, accent color front and rear wheel lip molding, lower body-side molding, and molded cab steps, unique accent color box top and tailgate moldings, accent color rear bumper with step pad, PowerScope power telescoping and folding trailer tow mirrors with power/heated glass, integrated clearance lights, turn signals and memory feature, body color mirror caps, unique 18" painted aluminum wheels with unique center caps with King Ranch logo, power sliding rear window, memory power adjustable pedals, unique front and rear floor mats with King Ranch logo, front heated seats, unique door trim panels with King Ranch Chaparral leather insert and woodgrain applique, front and rear consoles with King Ranch Chaparral leather-covered lid/armrests, unique King Ranch Chaparral leather-wrapped steering wheel with redundant controls, unique King Ranch Chaparral leather seating surfaces quad captain's chairs, memory power adjustable driver seat and power adjustable passenger seat, chrome exhaust tip, chrome tow hooks, unique chrome mirror caps, chrome pickup bed tie downs and 5" chrome tubular step bars. Includes four (4) LT275/70R18E OWL All-Terrain tires, 18" forged polished aluminum wheels and one additional matching spare tire and wheel. Includes Audiophile AM/FM stereo with MP3-capable in-dash 6-disc CD changer, 8 speakers, subwoofer and clock. Includes monochromatic or unique two-tone exterior, body color front and rear bumpers, body color billet-style grille with body color surround, unique Harley-Davidson head lamps and "Harley-Davidson F-Series Super Duty" badges on front fender and tailgate, front and rear body color wheel lip moldings, body color door handles, chrome illuminated tubular step bars with unique Harley-Davidson Bar and Shield logo, unique chrome exhaust tip, unique engine decal and Ford/Harley-Davidson vanity license plate, rubber bed mat with Harley-Davidson Bar and Shield logo, power telescoping, Powerscope power telescoping trailer tow mirrors and folding features, power and heated glass, integrated clearance lights, turn signals, body color mirror caps and memory feature, chrome front tow hooks and tie downs, unique 20" polished forged aluminum wheels with chrome lug nuts and Harley-Davidson Bar and Shield on center cap and wheel lock kit, LT275/65R20E all-terrain BSW tires with LT275/70/18E all-terrain BSW spare tire and 18" spare wheel, unique windshield with Bar and Shield dot pattern and Alliance logo, power rear sliding window, unique black leather-wrapped steering wheel with redundant audio/climate controls, unique memory power adjustable pedals, unique ebony door trim inserts with black leather-wrapped armrest and dusted copper leather-wrapped pull handle with chrome accent, unique "Bar & Shield" logo center finish panel, ebony carpet, unique black carpet floor mats with Harley-Davidson script, unique owner's guide with leather Ford Harley-Davidson F-Series Super Duty logo embossed portfolio, laser engraved serialization plate attached to the leather front console lid, unique key set with Ford Harley-Davidson logo on key ends, unique black leather quad captain's chairs with embossed Harley-Davidson Bar and Shield logo, front and rear center console in unique leather, memory heated power adjustable driver's seat and heated power adjustable passenger seat. Includes four (4) LT275/70R18E BSW All-Terrain tires, 18" forged polished aluminum wheels and one additional matching spare tire and wheel. 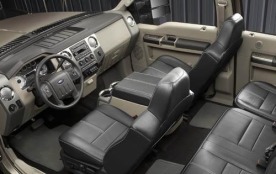 Includes power sliding moonroof with "one touch" express open and overhead console. Includes memory power telescoping, power folding trailer tow mirrors with power and heated glass, integrated clearance lights and turn signals, memory power driver's seat and memory power adjustable pedals. Includes power telescoping and power folding trailer tow mirrors with power and heated glass, integrated clearance lights and turn signals. Includes navigation radio with in-dash screen and DVD-ROM, and Audiophile AM/FM stereo with MP3-capable in-dash 6-disc CD changer, 8 speakers, subwoofer and clock. Forced on Power Stroke diesel engines. Available as a Fleet only option on all F-350 vehicles with gas engines. 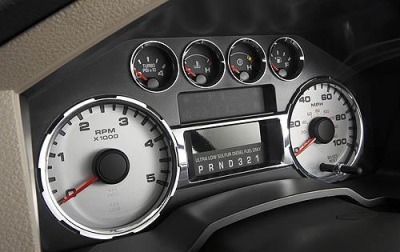 Includes computer selected springs along with a 200-amp alternator and a unique fan clutch when ordered with the Power Stroke diesel engine. 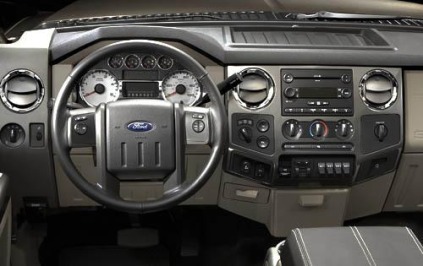 Includes 5-speed electronically controlled automatic transmission with Tow/Haul feature and temperature gauge. Includes premium AM/FM stereo with MP3-capable in-dash 6-disc CD changer, 4 speakers and clock. Includes heavy service front springs (1 Up upgrade above the spring computer selected as a consequence of options chosen. Not included if maximum springs have been computer selected as standard equipment), rear stabilizer bar and slide-in camper certification. Includes four (4) LT275/65R20E OWL all-terrain tires, one (1) LT275/70R18E BSW all-terrain spare tire and 20" premium polished forged aluminum wheels with bright hub covers and center ornaments. Includes TowCommand integrated trailer brake controller (Verified to be compatible with electric-actuated drum brakes only) and power telescoping, power folding trailer tow mirrors with power and heated glass, integrated clearance lights and turn signals. Includes 6.4L V8 twin turbocharged diesel engine with 350 hp @ 3000 rpm and 650 lb-ft of torque @ 2,000 rpm. Required on all units ordered by dealers for California Emissions States registrations when the vehicles are being delivered to non-California Emissions, non-Cross Border States locations. Also requires 422 California Emissions System.